Get the same workout that you would from using a professional stair climber using this compact easy to store mini stair climber. You'll get a great fat burning workout and tone your buns and thighs. 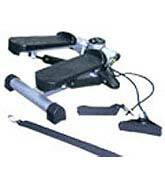 The extra wide foot pads allow an 11 inch range of motion and features a non-slip base so you can exercise safely. LCD monitor displays time, steps taken, strides per minute and calories burned. Attach the long bar or individual handles for a great toning workout.